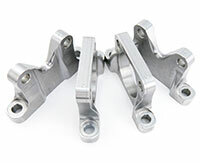 Improved RT-10 Rocker Arm Supports are required when increasing the horsepower & performance on the Weber MPE-750 engine. Increasing the boost pressure, altering the ignition timing curve and /or changing any part of the original configuration can cause the rocker supports to break. Our billet hardened stainless steel supports can offer increased protection up to 250 Hp.